Leabank Square: Ted - Hero of Leabank Square!! Not only is this is the guy with the numbest bum on the Olympic site today - but he is also the 1st Hero of Leabank Square!! Everyone can remember how long it took Sóna to dig the borders for the Edible Garden (zzzzzzzzz) - but it took one day for Ted to dig borders double the length on the green!! Admittedly he had hundreds of Skanska comrades to follow him with spades, shovels, wheel-barrows, rakes, trowels, top-soil, compost, sunflowers, tomatoes, pumpkins, beans, peas, chives, turf & loads of sweat - but he had to sit on the digger all day long to get through all the builders rubble under the green!! Ted - the whole of Leabank Square (metaphorically) lines up on the green, faces the Olympic site - and collectively - salutes your numb bum! We sincerely hope there is a Mrs Ted to soothe away the aches & pains you must be enduring on all our behalf. Thank you for the beautiful deep, nutrient rich soil borders you dug for our food mate, you are truly the best deserving first recipient of 'Hero of Leabank Square'! And Sóna..... did you see the skill Ted used to go around the tiny Skimmia bush?! It was almost as if he was using a tiny trowel instead of a motorised digger! Ted also moved the planters at the entrance back into position! Now at long last we can start making the entrance a bit more presentable! Ted, you have no idea how long they have been bugging some of us (well me anyway). 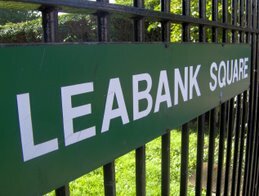 Now we need to sort out a gate for Leabank Square!